THORNTON, Henry (1760-1815), of Battersea Rise, Clapham Common, Surr. b. 10 Mar. 1760, 3rd s. of John Thornton, Russia merchant and dir. Bank of England, of Clapham by 2nd w. Lucy, da. and h. of Samuel Watson, Russia merchant, of Kingston-upon-Hull Yorks. ; bro. of Robert Thornton* and Samuel Thornton*. educ. Dr Davis’s sch. Wandsworth Common 1765-73; Mr Roberts’s sch. Point Pleasant, Wandsworth 1773-8. m. 1 Mar. 1796, Mary Anne, da. of Joseph Sykes, Russia merchant, of West Ella, Yorks., 3s. 6da. Asst. Russia Co. 1789-1811; chairman, Sierra Leone Co. 1791-1811. Capt. Battersea and Streatham vols. 1798. Thornton tried to interest the Portland ministry, too, in taking over the Sierra Leone Company, 29 July 1807, and in the following year succeeded. After the abolition of the slave trade, a jubilant Wilberforce had asked him ‘well, Henry, what shall we abolish next?’ The reply was, ‘The lottery I think’. 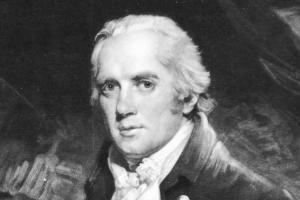 In fact it was economical reform that preoccupied Thornton in the Parliament of 1807.
was the verse sung by his Southwark supporters.5 On being re-elected to the finance committee, 30 June 1807, he sought to carry out the reductions proposed by its predecessor, collaborating with Henry Bankes and sometimes taking the chair. The committee’s report on the Bank, which aimed to save the public £240,000 p.a. was supervised and defended by him in the House, 10 Feb. 1808, in defiance of the views of his family and City connexions. At the same time he concurred with Wilberforce’s line of judging ministerial measures by their merits, which palliated opposition fears that he had gone over to ministers.6 He voted with opposition on the Copenhagen expedition, 3 Feb. 1808, on the mutiny bill, 14 Mar., and on the admission of Catholics to the Bank of Ireland, 30 May. He regretted the amendment secured by the ministerial members of the finance committee to their report on sinecures, 29 June 1808. While he objected to the wilder allegations made by Col. Wardle in the House on corruption in the army administration, 31 Jan. 1809, he thought the Duke of York had connived at it and accordingly voted for Bankes’s amendment of 15 Mar. and opposed Perceval’s exoneratory resolution, 17 Mar. On 20 Mar. he supported the opposition amendment to proceed no further against the duke, following his resignation from the command. This line of conduct did not go far enough to please many of his constituents, as he discovered at a Southwark meeting on the subject, 12 Apr., but they applauded his promise to support parliamentary reform and the abolition of sinecures.7 On 20 Apr. he advocated making the purchase of seats in the House an offence under the sale of offices prevention bill. He voted with opposition on allegations of ministerial corruption, 25 Apr. and 11 May. He was chairman of the committee which exposed the peculation of £44,000 by the Dutch commissioners, debated on 1 May. He was as good as his word in supporting sinecure regulation, 8 May, 2 and 8 June, and parliamentary reform. He complained that Curwen’s reform bill did not go far enough, penalizing voters but not those who bought them, and he voted for Burdett’s reform motion on 15 June. On the other hand, he assured Col. Wardle that there was no more scope for retrenchment than that already sketched by the finance committee, 19 June. On 31 Jan. 1810, having seconded Bankes’s motion to abolish offices in reversion in perpetuity, he was renamed to the finance committee. He had voted with ministers on the address, 23 Jan., but joined opposition throughout on the Scheldt inquiry, so that they listed him ‘hopeful’. He supported Bankes’s amendment to the army estimates, 1 Mar. He voted against Burdett’s imprisonment and for the release of Gale Jones, 5, 16 Apr., and on 15 June presented his constituents’ petition for Burdett’s release. He voted for Romilly’s bid to limit the imposition of capital punishment for theft, 1 May, spoke and voted for sinecure reform, 3 and 17 May, and voted for parliamentary reform, 21 May 1810: he was circularized, unavailingly it seems, by the Friends of Constitutional Reform in 1811. 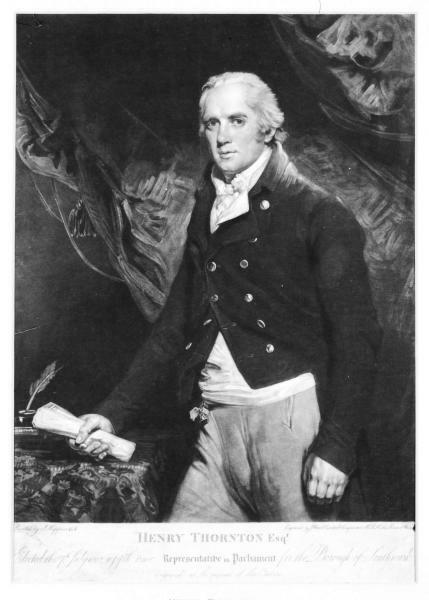 He joined opposition on the Regency questions of 1 and 21 Jan. 1811 and voted for the election treating bill, 25 Mar. He opposed the reinstatement of the Duke of York as commander-in-chief of the army, 6 June. That session he spoke as a member of two committees: that on commercial credit, appointed 1 Mar., supporting their findings, and as a member (sometimes chairman) of the bullion committee appointed the previous session. Thornton, with Francis Horner and William Huskisson, had prepared the report of the bullion committee which he defended on 6 May 1811. He set out to prove that if the shortage of specie had its origin in an unfavourable balance of trade, it was exacerbated by the quantity of paper money in circulation, which must be restricted. These views he further defended against his critics on 13 May and published. He went on to express reservations about the bank-note bill, 15 July 1811, 26 Mar., 10 Apr. 1812, but admitted, 8 Dec. 1812, that the time was not ripe for the resumption of cash payments by the Bank, which led Robert Peel to suppose that he had made a ‘complete recantation’. He could scarcely have concurred.8 On 13 Feb. 1812 Thornton opposed Whitbread’s motion blaming the orders in council for the imminence of war with the USA, but he joined opposition to the orders, 3 Mar., and supported investigation into abuses of them, 16 Apr. He voted steadily for sinecure reform and retrenchment that session, describing the grant to the royal princesses as a burden to the people, 23 Mar. He also voted for Catholic relief, 24 Apr., but was in the government minority against a more comprehensive administration, 21 May. 1. Coupland, Wilberforce, 251; Thornton, Enquiry into the Nature and Effects of the Paper Credit of Great Britain ed. Von Hayek, 21, 25; Life of Wilberforce (1838), i. 236, 373-4; Morning Chron. 15 July 1791; J. C. Colquhoun, William Wilberforce, 290, 293; E. M. Howse, Saints in Politics, 46; Glenbervie Diaries, i. 181. 2. Public Advertiser, 17 June 1790; Morning Chron. 23 May 1796, 12 Dec. 1797; Colchester, i. 115, 155; PRO 30/9/31, Abbot diary, 20 July 1797, 12 June 1798; Coupland, 261; Von Hayek, op. cit. ; Gent. Mag. (1816) i. 67. 3. The Times, 10, 30 July 1802. 4. Rose Diaries, ii. 238, 239; The Times, 31 Oct. 1806, 5 May 1807. 5. Colquhoun, 286; Life of Wilberforce, iii. 298; E. M. Forster, Marianne Thornton, 55-57. 6. Coupland, 334; Buckingham, Court and Cabinets, iv. 197. 7. Acct. of the Procs. of the Electors of Southwark, 12 Apr. 1809 . 8. Horner Mems. ii. 47, 61; PRO 30/9/35, Abbot diary, 6 May 1811; Add. 40605, f. 9. 9. Wilberforce Corresp. ii. 304, 307; Colquhoun, 271; E. Halévy, England in 1815, p. 133.